"Classy and clever. Portia Adams is equal parts toughness and charm." - Tim Wynne-Jones, two-time winner of the Arthur Award from the Crime Writers of Canada "Even for teens who haven't yet encountered Doyle's stories, Portia Adams will prove to be a whip-smart, worthy new heroine." - Quill and Quire "Misri has made a clever contribution to Sherlock Holmes spin-off literature. 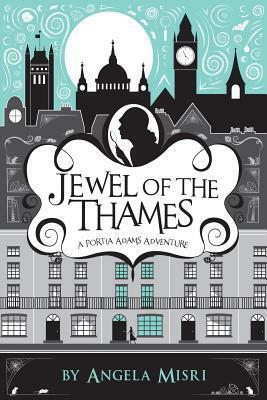 Jewel of the Thames will introduce younger readers to the Holmes world while also appealing to seasoned Sherlock fans." - CM Magazine Collector's Edition Features: Signed bookplate from the author Free eBook version "Elementary, dear reader" extra content from the author There's a new detective at 221 Baker Street Set against the background of 1930s England, Jewel of the Thames introduces Portia Adams, a budding detective with an interesting - and somewhat mysterious - heritage. Nineteen-year-old Portia Adams has always been inquisitive. There's nothing she likes better than working her way through a mystery. When her mother dies, Portia puzzles over why she was left in the care of the extravagant Mrs. Jones but doesn't have long to dwell on it before she is promptly whisked from Toronto to London by her new guardian. Once there Portia discovers that she has inherited 221 Baker Street - the former offices of Sherlock Holmes and Dr. Watson. Portia settles into her new home and gets to know her downstairs tenants, including the handsome and charming Brian Dawes. She also finds herself entangled in three cases: the first involving stolen jewelry, the second a sick judge and the final case revolving around a kidnapped child. But the greatest mystery of all is her own. How did she come to inherit this townhouse? And why did her mother keep her heritage from her? Portia has a feeling Mrs. Jones knows more than she is letting on. In fact, she thinks her new guardian may be the biggest clue of all. Featuring casebook illustrations by Sydney Smith. E - Everyone over ten: Content is suitable for everyone but may contain mild violence and language and minimal suggestive themes.